Wang, L., Wang, Y. and Felix, G. (2019). Peptide Feeding and Mechanical Wounding for Tomato Seedlings. Bio-protocol 9(6): e3194. DOI: 10.21769/BioProtoc.3194. 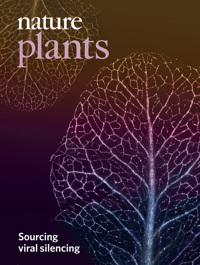 Plants need to respond appropriately to wounding and herbivorous insects. Peptide signals have been implicated in local and systemic induction of appropriate plant defense responses. To study these peptide signals and their perception in host plants, it is important to have reproducible bioassays. Several assays, such as treatment of peptide solution via pressure infiltration, have been developed. Here, we provide detailed protocols for peptide feeding and mechanical wounding for tomato seedlings. To directly introduce peptides into tomato seedlings, peptide solution is fed through the excised stem via the transpiration stream. 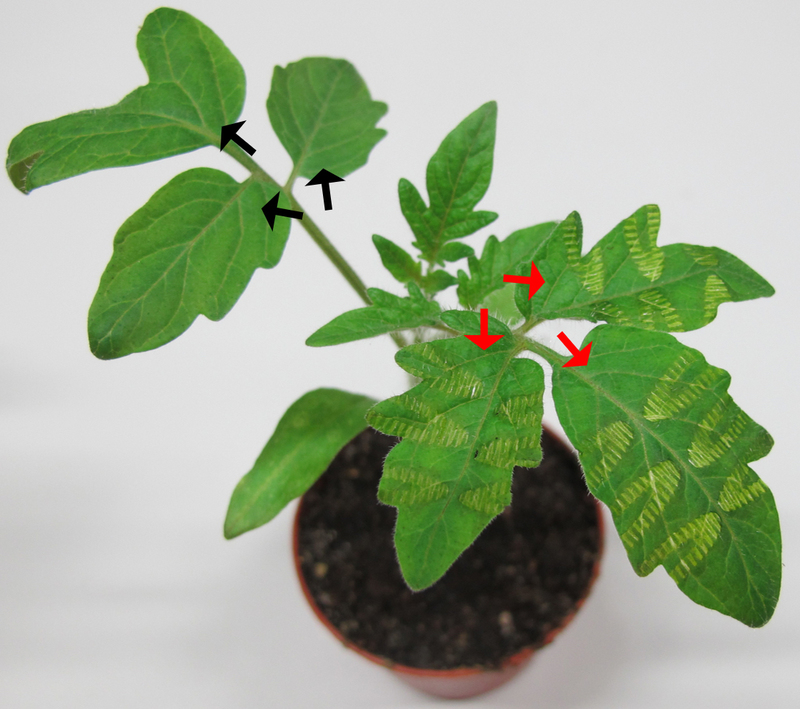 To mimic the wounding caused by insect feeding, leaflets of tomato seedlings are mechanically damaged with a hemostat; and wounded and systemic unwounded leaves are harvested and analyzed separately. Samples from both assays may be further assessed by examining the transcript level of marker genes by quantitative real-time PCR (qRT-PCR). Peptide signaling plays crucial roles in regulating plant growth, development and interaction with the surrounding environment (Tavormina et al., 2015). Perception of the peptide systemin, for example, is critical for resistance against chewing insect larvae (Pearce et al., 1993; Wang et al., 2018). Attack by such larvae and related wounding lead to various immune responses, one of which is the induction of defense-related marker genes. In tomato, the genes encoding proteinase inhibitor 1 (PIN1) and proteinase inhibitor 2 (PIN2) were shown to be highly activated after insect feeding or wounding, and have been extensively used as hallmarks for defense triggered by insects or wounding (Pearce et al., 1991; Ryan and Pearce, 2003). Here we provide a protocol focusing on details of peptide feeding and wounding assays, which can be followed by quantification of PIN1 transcript via qRT-PCR. The protocol has been optimized to minimize variations inherent in these assays and was previously used to assess the function of systemin perception (Wang et al., 2018). Sow tomato seeds on a single 9.5 cm diameter pot filled with potting soil. Cover seeds with ~5 mm soil. Place the pot in a tray filled with ~1 cm water. Cover the tray with a transparent plastic lid. Place the tray in a greenhouse with the following conditions: 14 h light/10 h dark; 25 °C/19 °C day/night; 30%-40% relative humidity; 12.38 klx. Remove the lid 1 day after seed germination. Note: Covering seeds with a thin layer of soil will help remove seed coats from cotyledons during germination. Twelve tomato seedlings are required for each treatment. To guarantee enough seedlings of the desired size, it is recommended to sow 50% more seeds. Around 10 days after sowing, separate individual tomato seedlings of similar size into 6.5 cm diameter pots when the first true leaves are emerging (Figure 1). Leave as much hypocotyl above the soil as possible during transplanting. Place the pots in a tray, and water the pots thoroughly from the bottom by adding water on the tray. Cover the tray with a clear lid. Note: A long hypocotyl will reduce the chance that the tomato seedlings lose contact with peptide solution/water during the feeding assay. Remove the lid after two days. Water plants daily from the bottom of the pots by adding water on the tray. Grow tomato seedlings until the third true leaves are emerging (~18 days after sowing). Note: Seedlings of different tomato cultivars have different growth rate. Refer to the size of the seedlings rather than growing time. The morning before the feeding assay, water the tomato seedlings thoroughly from the bottom. Do not water them after this time point. Dissolve systemin peptide powder in sterile water to make a 10 mM stock. Dilute peptide stock solution to 100 nM with sterile water immediately before the feeding assay. Prepare 4 ml peptide solution for each seedling and 50 ml extra as backup. 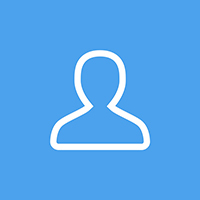 Store the remaining peptide stock at -20 °C. Add 4 ml peptide solution (or sterile water as the control) into glass test tubes. 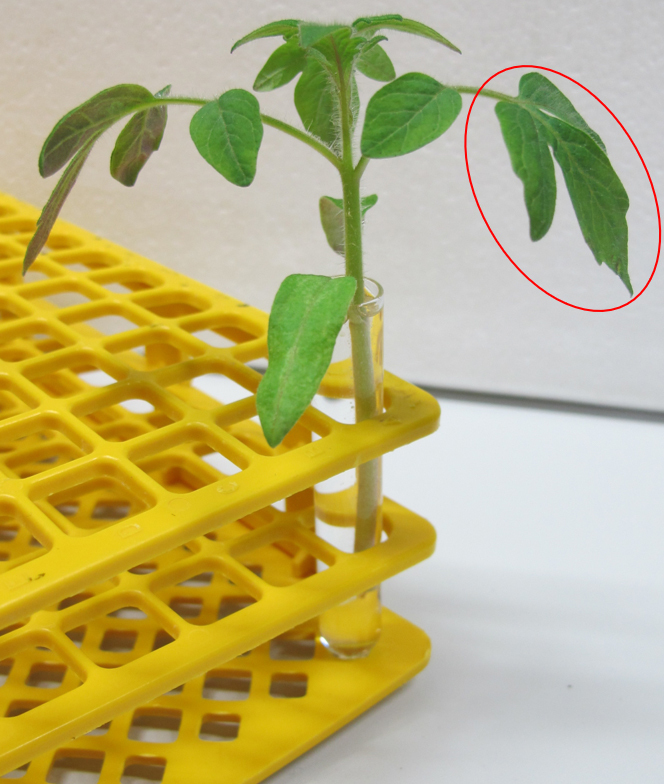 Excise tomato seedlings of similar size at their bases (~3 mm above the soil) with a razor blade and put the seedlings immediately into glass test tubes containing peptide solution (1 seedling per tube) (Figure 2). Wear gloves during treatment and always change gloves when switching solutions. Note: When dealing with a large number of samples, estimate the time needed in advance for treating and harvesting every group of samples. Leave 10 min for buffering between two groups. Avoid cross-contamination and wounding of seedlings. Figure 2. Tomato seedlings fed with peptide solution. The red circle indicates the leaf to be harvested. Feed seedlings with peptides (or water as the control) via the transpiration stream for 1 h in the greenhouse. Meanwhile, prepare new glass tubes fully filled with sterile water. Transfer seedlings into new glass tubes. Avoid cross-contamination of peptide solutions by switching gloves between different sets of treatment. Incubate excised seedlings in the greenhouse for 8 h. Check liquid level every 2 h. Refill the tubes with sterile water once they are half empty. Note: Due to differences in solution uptake, some plants may wilt slightly at first. They will recover after further incubation. Harvest 1 leaf from the first pair of true leaves with scissors. For each treatment, pool leaves from 3 plants as 1 biological sample and prepare 4 biological samples. Note: The amount of peptide taken up through transpiration stream may differ greatly among different plants. It is thus important to use pooled samples as biological replicates to minimize variation. Wrap leaf samples quickly with aluminum foil. Freeze the samples immediately in liquid nitrogen with tweezers. Store samples at -80 °C for further analysis. Prepare ~18 days old tomato seedlings in the same way as described in Steps A1-A3. Water the plants thoroughly from the bottom of the pots in the evening before the wounding assay. Note: It is important to have sufficient water in the soil before performing the wounding assay. The plants should not be watered during the assay. Early the second morning, pinch the leaflets of one leaf from the first pair of true leaves with a hemostat twice at each side of the mid-rib, once at ~1/4 part of the leaflets and the other time at ~3/4 part. Supply enough pressure to wound the leaf surface but not too hard to penetrate the leaf. Clean the jaw of the hemostat with 70% ethanol between the different sets of treatment. Note: Do not break the mid-rib during wounding; otherwise the leaflets will dry out by the end of the assay. Three hours after the first wounding, pinch the same leaflets once again at ~1/2 part (Figure 3). Figure 3. 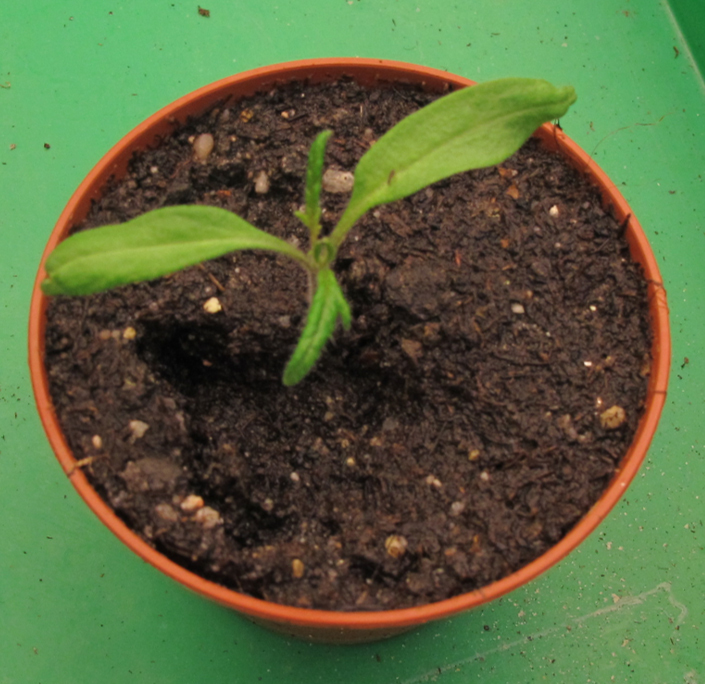 A tomato seedling with a leaf wounded by a hemostat. Red arrows indicate the leaflets of a wounded leaf, black arrows indicate the leaflets of a systemic leaf (unwounded leaf from the same plant). Twelve hours after the first wounding, harvest the leaves with a pair of scissors. Pool 3 leaves (1 leaf per plant) from the same tomato line as a biological sample. Collect unwounded leaves from the treated plants as systemic leaves. Collect leaves from untreated plants as control leaves. Note: PIN1 transcript levels in different tomato seedlings may vary greatly after induction. To reduce variation, it is important to pool several plants as a biological sample. Prepare 4 biological samples per treatment. Wrap leaf samples quickly with aluminum foil and freeze the samples immediately in liquid nitrogen with tweezers. Store samples in a -80 °C freezer for further analysis. This protocol is partially adapted from Pearce et al. (1993). This work was funded by the grant DFG-CRC1101-D05. Pearce, G., Johnson, S. and Ryan, C. A. (1993). Structure-activity of deleted and substituted systemin, an 18-amino acid polypeptide inducer of plant defensive genes. J Biol Chem 268(1): 212-216. Pearce, G., Strydom, D., Johnson, S. and Ryan, C. A. (1991). A polypeptide from tomato leaves induces wound-inducible proteinase inhibitor proteins. Science 253(5022): 895-897. Ryan, C. A. and Pearce, G. (2003). Systemins: a functionally defined family of peptide signals that regulate defensive genes in Solanaceae species. Proc Natl Acad Sci U S A 100 Suppl 2: 14577-14580. Tavormina, P., De Coninck, B., Nikonorova, N., De Smet, I. and Cammue, B. P. (2015). The plant peptidome: an expanding repertoire of structural features and biological functions. Plant Cell 27(8): 2095-2118. Wang, L., Einig, E., Almeida-Trapp, M., Albert, M., Fliegmann, J., Mithofer, A., Kalbacher, H. and Felix, G. (2018). The systemin receptor SYR1 enhances resistance of tomato against herbivorous insects. Nat Plants 4(3): 152-156. How to cite: Wang, L., Wang, Y. and Felix, G. (2019). Peptide Feeding and Mechanical Wounding for Tomato Seedlings. Bio-protocol 9(6): e3194. DOI: 10.21769/BioProtoc.3194.